One of my first thoughts when Chris proposed was ‘yay, i get to ask the girls to be bridesmaids!”. So as soon as the engagement party was out of the way I got to work on some little gifts for my Bridesmaids to be, in order to officially pop the question. I had stumbled upon some lovely ideas on pinterest, of which my favourite was a box of goodies. You can see it here. I have always loved boxes anyway, so it was settled, I would make them a box each! You can see my original post from Wrapped Up in Rainbows here. Now, I am trying to be a bit thrifty so wooden boxes were out of the question. Luckily I had 4 contact lens boxes that were all the same size and would do the job nicely. I covered them in brown paper which I already had, and decorated them using nail varnish. Strange I know, but they were the only paints I had which fitted my colour scheme idea. Inside each box was a handmade, personalised notebook with their initial on, a pretty pen, a contact list, a bag of rainbow drops, a bar of chocolate, a soppy note to each of them, and an invitation to ‘Bridesmaid Day”! I really loved making them and the girls seemed suitably chuffed when they received them. So … then it was time to work on Bridesmaid day! As usual, my ideas were rather more ambitious than what actually materialized. Lack of time meant that I didn’t do everything I had planned, but the day was still a fantastic success! We chatted, ate pizza, drank mojitos, painted our nails and drank hot chocolate from my DIY ‘Team Bridesmaid’ mugs which I had made specially for the girls. You can see the whole post here. It was really nice to have all the girls together for the whole day, and I would definitely suggest doing this, especially if not all of your bridesmaids know each-other well. 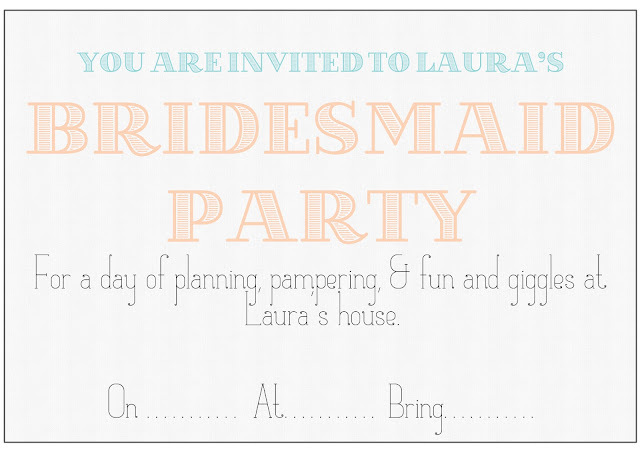 If you too are a bride-to-be you should exercise your right to throw parties as often as possible before the big day! Have you been using your wedding as an excuse to throw parties?